Naota is a normal Japanese 6th grade boy, cynical about life and just wanting to be left alone. But his older brother leaves for America to play baseball, leaving his homeless 17 year old girlfriend Mamimi behind. Mamimi is sending mixed signals and advances to Naota, and at his age he doesn't know what to do about her. But to make matters worse, Naota's world is totally turned upside down when he is run over by a woman riding a Vespa. During their first encounter, she hits him over the head with her bass guitar, which then causes a giant horn to grow out of his forehead. She calls herself "Haruko" and her presence changes Naota's life forever, and there's some kind of space things involved. 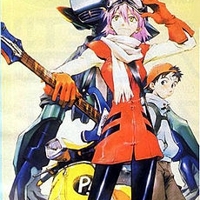 3496 users rated FLCL [TV].